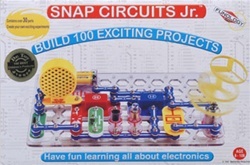 Electronic Snap Circuits Jr. kit from Elenco Electronics. battery blocks, different length wire blocks, etc. Blocks are easily identified by their color and number. Contains over 30 parts! You can even create your own experiments! help you operate and experiment with each project. Colored diagrams with each project.